Manchester United star Paul Pogba has hailed Barcelona ace Lionel Messi, calling him an 'extraordinary' player who is 'far above the rest'. The Red Devils are currently preparing for the first leg of their Champions League quarter-finals clash against La Liga giants Barcelona, in a fixture that has been deemed to be the most entertaining one of the last eight in the competition. United miraculously overturned their 2-0 deficit against Paris Saint-Germain in the second leg of their Round of 16 fixture to secure a spot in the quarter-finals. Romelu Lukaku and Marcus Rashford found themselves on the scoresheet to cap yet another crucial win for manager Ole Gunnar Solskjaer. 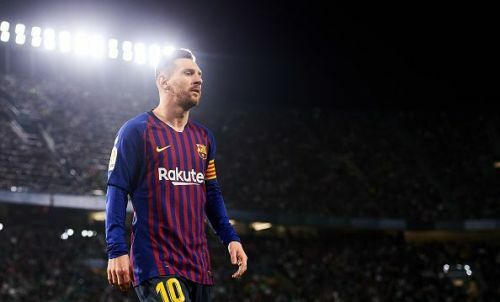 Barcelona, on the other hand, progressed to the next stage of the Champions League after an individual masterclass by Messi, who scored two goals and provided two assists to make Lyon succumb to a 5-1 defeat. "Barcelona are a team I always watch. You can always learn as a midfielder, I like watching football. Their system, their culture...it can always help me." "Barcelona is a great team, one of the best in the world. They have extraordinary players." "It's a match where I want to have fun. Playing against one of the best teams in the world is always a pleasure. It's a team I lost against in the Champions League Final [2015, Juventus], but it's always good to play against the best." "He is the best of all. Barca have great players and, above all, an extraordinary one that is far above the rest." The first leg clash between United and Barcelona has been scheduled to take place on April 10 at Old Trafford.